Students made the masks for a school auction. 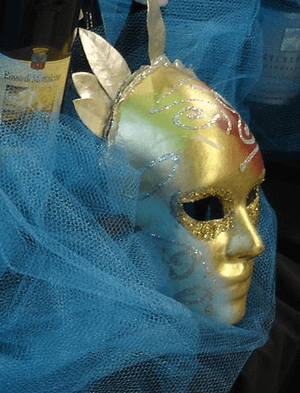 Venice is a popular fundraising auction theme. The imagery of the city is perhaps most closely associated with its famous canals, followed by its infamous Carnival. But as canals are difficult to recreate in a school gym, most groups opt for the Carnival masks. 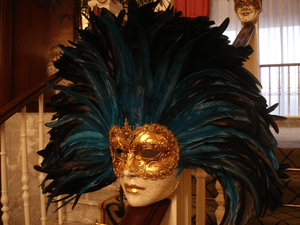 Venetian masks are festive elements to use, easily portable, and come in a range of price points that fit most any budget. At a school auction, both hand-crafted and purchased masks were used. They were placed on the silent auction tables and used as centerpieces. At a nonprofit auction, the masks greeted guests on the stairwell as guests entered the silent auction. At a nonprofit auction, the venue was the Ritz-Carlton. The elaborate masks matched the more upscale location. Like at the school, the nonprofit opted to use the masks in several ways. They served as a decor element throughout the venue and were incorporated into the centerpieces. If the masks look nice, sell them to recoup your costs. They sell well onsite. It’s a fairly low-effort auction theme. And if your guests are the type to dress the part, they’ll appreciate the masks as an added feature to their already elaborate costumes. This is a great fundraising ideas for non profits i never thought of doing auctions, especially for art. The masks are very beautiful! An inspiring idea to use students to create these fabulous marks as table centrepieces. I’m sure that it made the evening far more enjoyable and memorable for the guests.